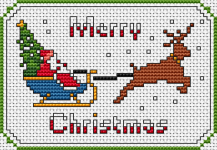 Holidays cross stitch pattern of Santa riding in his sled. Christmas themed Bookmark design of Santa with Christmas tree and his reindeers. Christmas-themed bookmark pattern of kids wearing cute red hats. Cute pattern of a gingerbread man wearing a Santa hat. 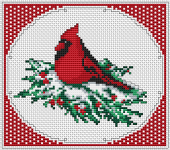 The red cardinal bird, one of the symbols of Christmas. The red cardinal holds a special spiritual meaning, symbolizing everlasting vitality. Christmas ornament of a cute angel holding a heart. Designed especially for 14 count red fabric. 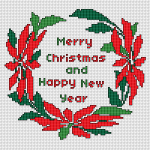 Holiday-themed pattern of a wreath in red and green with the text: Merry Christmas and Happy New Year. 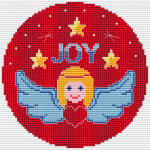 Merry Christmas cross stitch card design for 14 count fabric white.This pattern uses 6 DMC thread colors. Cute pattern of a gingerbread man with the words: "Bite me". 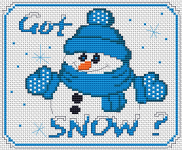 Winter themed pattern.Enjoy the snow with this cute snowman asking: Got snow?